After last month’s Fandomly box, I wasn’t getting my hopes up very high for this month’s box. And with the Harry Potter theme, trust me, I really wanted to get my hopes up. Last month was a total flop when it came to The Hunger Games themed box, and my review went into detail on why I thought it wasn’t a box I was going to be signing on for, for any longer than I already had. Well….it’s not QUITE as bad as last month but…hmm. Where to start. First was the packaging. Still the same colored padded envelope with NO business logo or anything to tell me what was in the package. That includes the return address (which was faded), but reads, The Charming Box. Last I checked, this subscription was called Fandomly, so I was really confused as to what I was opening. Then the tiny square of tissue paper fell out of the package, containing everything you see above. Again, I’m sure you can imagine my disappointment. The jewelry is cute, I’ll give it that. I love the concept behind both pieces. BUT, for the same price, Fandom of the Month provides such a higher quality of pieces, I just can’t wrap my head around these. The first was a Hogwarts logo necklace. Yea, it’s cute and I like the length of the chain (about 18″) however, the chain is a completely different color. The background behind the colored enamel is gold, but the chain is already a light yellow/silvery tone, as though it was originally plated in yellow, and has been worn so it’s faded off. I wanted to like the bracelet. I did. But then I attempted to wear it. 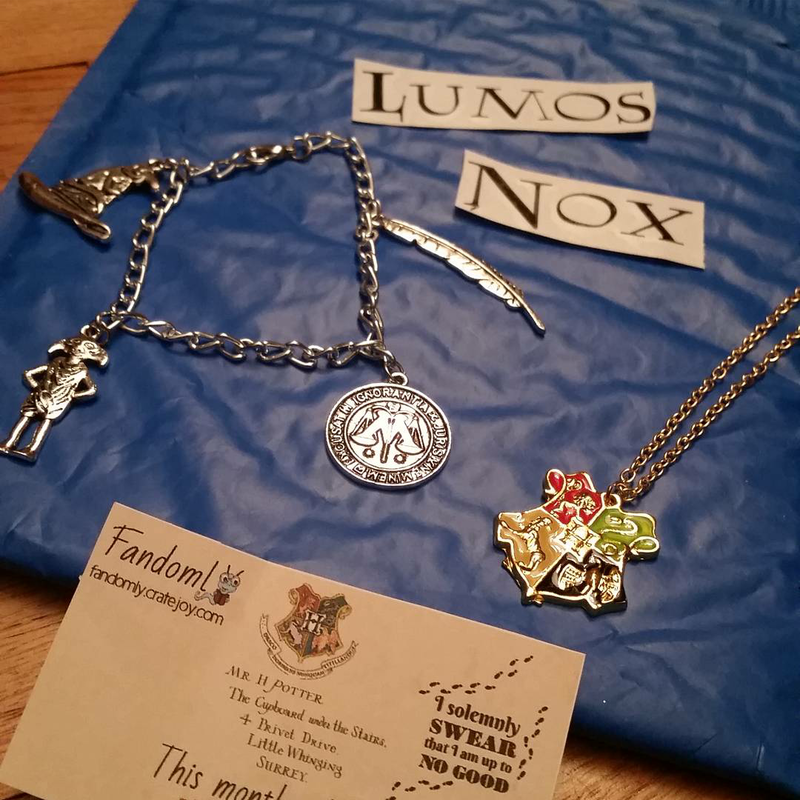 The bracelet this month was a ‘silver’ charm bracelet with Dobby, the Sorting Hat, a coin, and a feather. At first glance, it’s cute. But then I tried it on. First of all, it’s incredibly difficult to hook. There is a small lever clasp, and very little chain to play with and adjust lengths, so it’s pretty much a one size fits all bracelet. Then I was finally able to wear it and within a few minutes, I had caught it twice on my clothing. The charms are massive. Finally was the ‘household item’ this month and as advertised on their Instagram page, it looks as though you’d be getting a light switch cover. You’re getting stickers. Rub ons. To add to your current light switch cover. Honestly, light switch covers aren’t that expensive and I would have really enjoyed having a new one. It’s two screws and would have been a piece of cake to throw on the wall. I understand the goal to make the decals as versatile as possible for all light switches but honestly, it wasn’t worth sending two little cut out decals. The money I spent on this box in the last two months would have been well put toward another box that was much more deserving than this. I’m glad to no longer be receiving future boxes from this company and am so disappointed for others who received the same poor quality items I did for the price. If you ARE, in fact, interested in receiving a box, regardless of my thoughts, I wish you all the best! And you can sign up at their website, here.